Going boating is a great time with friends and family; however, if you have a pet, then it can be even better. Going boating with your dog can be such a fun time, but it’s important that you remember all of the items that you need. In our past blogs, Prepare To Take Your Puppy Out Boating and Boating Safety With Pets, we went over some safety tips for your animals when you’re out on the water. Our boating blogs about pets go over safety information that will keep Fluffy safe as well as the rest of your family or friends while on a pontoon boat. 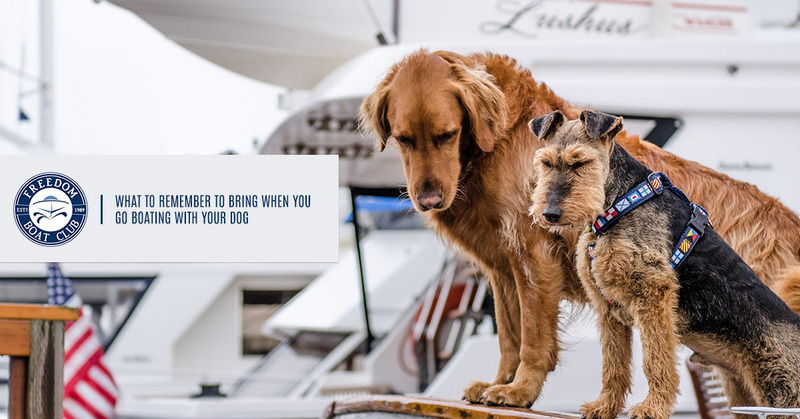 In today’s blog, we’ll be covering a few things that you shouldn’t forget if you’re going boating with your pet. If you want to go boating with your pets, then we recommend contacting us for a boating membership. It’s difficult to remember all of the items that you need to bring for yourself, but it can be even harder when you need to bring everything for your dog as well. However, it’s vital that you remember all of the items that you need to bring for your pet when you go boating. These items are important because you’ll want to keep your animal safe as well as yourself. As a pet owner, you know that you should bring a leash everywhere; however, if your pet is so well-behaved that a leash isn’t a necessity, you may forget to bring one every now and again. While we believe that Fido is well-behaved, we recommend bringing a leash to ensure that no accidents occur on the boat as well as Freedom Boat Club. A leash will keep everyone safe, so don’t forget to bring while when you go boating on Lake Lanier. Another item to remember to bring is doggie bags. Nature can call while you’re out boating and it’s best that you have a plan ready if that’s the case. If your pet is not housebroken, then it’ll be difficult for them to go to the bathroom because they’ll be reluctant. On the other hand, it can be hard for animals that are not housebroken to not go on the boat. The best option should be purchasing or bringing doggie bags to ensure the boat stays free of defecation. Everyone needs water, your pet included. Water is one of the most important items that you can bring on the boat because dehydration with anyone can be very dangerous — animal or human. Water will keep everyone hydrated and healthy while out in the sun all day long. Water should be brought for your dog as well as everyone on board. You can purchase a collapsible bowl for your dog or bring your own. Whatever the case may be, it’s vital that you bring water no matter if the weather outside is beautiful and sunny or dreary and cloudy. Make sure that your dog has identification on him or her. Identification should be worn all of the time just in case your dog decides to take off to chase that squirrel while on land or because they heard a noise. Identification should include your primary number on the pet’s tag. You can also get a microchip put beneath the skin of the animal to avoid any mishaps in case the tag falls off or is lost. A microchip can be read by vets and is a great way to keep track of your dog. Lastly, one of the most important items to bring is a life jacket. A life jacket is important for everyone on board to wear because it can save a person’s or an animal’s life. Life jackets can be great if the dog jumps overboard or if he or she falls overboard. There are many life jackets for dogs out there, which offers you the opportunity to find the perfect option for your animal. No matter what type of dog you may have, he or she should wear a life jacket because it’s the safest, especially if the water is choppy. Stay tuned for our next blog to ensure that you, your family, and friends, as well as the dog is ready to go boating on Lake Lanier.